Having spent several hours on Friday night figuring out how to set my camera to catch a meteor streak from this year’s Perseid shower, I went back out Saturday night to try again. It was a lot easier this time. I had the best exposure already set and had already figured out how to get the camera to take continuous pictures. All I did was aim, press the shutter button, and then sit back and relax. The night sky was darker on Saturday because I went out earlier, before the moon rose, but that also meant fewer meteors. I only saw one, but I wasn’t really watching closely most of the time. When I got home, I went through the 180 exposures the camera had taken, and found nothing. But then I went through them again, more slowly, and it turns out I got one after all. It’s a pretty faint streak, even with a bit of image processing, but it’s there.¹ It’s not much, especially for you folks who live in the desert or some other dark region and see meteors all the time, but it’s pretty good for us city dwellers. And why is the tree in the foreground so bright? Because lots of people had the same idea I did, and rolled by in their trucks and SUVs to look for good meteor-watching spots. Whenever one approached, its headlights lit up the trees, and it just happened that one did that during this exposure. I have several others with the tree lit up in yellow, red, and other colors depending on what kind of headlights the truck had. I swear, some of them were lit up like Christmas trees. ¹Why so faint? It was a five-second exposure, but meteors streak by in about a quarter of a second. 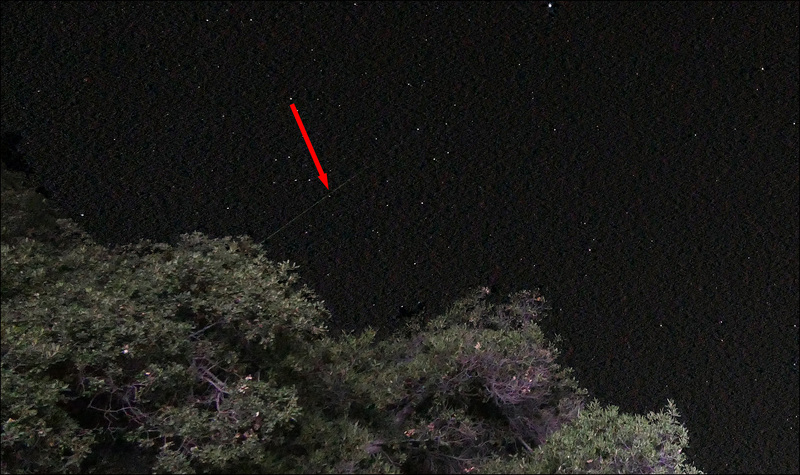 Even though the meteor is fairly bright, that’s just not enough time to capture very many photons. It’s times like this that I wish I had one of those cameras that went up to ISO 3 million.